My ability is my most prized possession, even though it separates me from everyone else. But for power, for my own power, it is a price I am willing to pay. I’m not without my own weapons. The low thrum in my blood is all I need, sharper than any blade, more brutal than any bullet. Sparks vein beneath my skin, ready if I need them. My ability has a subtlety that Cal’s lacks. I’m not a rat anymore. I’m the lightning girl, and now I have too many ideals to count. I bare my teeth in a snarl. If you cannot handle that then I highly recommend that you stray far away from this book. You know, I’ve realized something over my short time of being an avid reader. I have an odd tolerance for books I want to DNF really badly. And I feel that over the years, it’s gotten worse. Because I’m gonna rant, and cry, and pull my hair out by the end of this review, but next year, when the final book is going to be out in this series, who’s gonna check it out as soon as it becomes available in the library? This idiot right here. It’s like I can’t control myself, even if it’s six years from now, I know that I’m going to read the last book in this series. Anyway, moving on with the review: I have to admit, Red Queen was not my favorite book of the year, but I’d gotten carried away by the—what I thought was amazing at the time—ending. So, I ended up giving it 4 stars. But with Glass Sword it’s like I’m watching my investment literally ruin itself to absolutely nothing. I cannot express in words how deeply disappointed I am by this book. Mare Barrow (as I’m sure you’ve seen from the lovely evidence above) completely destroyed this book. Literally the only words in her dictionary are: me, myself, I, self-sacrifice, and lightning girl. When in reality, this revolution is bigger than her, and this world is bigger than her. Gone is the world of when I was fascinated by the blood divide and the tension, people! Prepare yourself for a lot of whining, walking, crying, and possibly the cheesiest, most infuriating let down ending ever! Oh ho, Mare sacrifices herself and Maven tortures her so much in the end, and I slammed this book down because I wanted to rip my hair out from investing so much time in the most cliché ending ever. This book only shows Cal, who is the love interest, even though Mare rambles on at a point where she doesn’t trust him (???). She constantly puts down Kilorn in the worst ways she can. She’ll take the smallest thing that he does and she’ll manage to twist it in a way that makes me want to shake her until her lightning fizzes out. She clearly thinks this team is running because of her, when in reality, she’s a narcissist woman—oh God, I meant child, she’s not even an adult—who has no respect for any of her other members and just cares about making every little thing she can find about herself. Overall, this book is just disappointing. Filled with a ridiculous main character (she is seventeen, like chill girl), the most mainstream love interest, and the most predictable plot with the worst case of second book syndrome that I’ve read, this book successfully made me count how many hours I wasted. 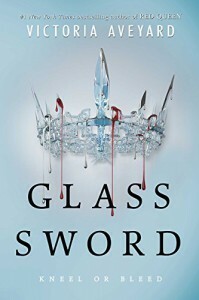 If you want a nice book to pull your hair over, then Glass Sword is the book for you.